Categories: Affirmative Action, Global Issues, Race. This issue speaks to attacks on political justice in the form of resurgent racism at home, as well as genocide and patterns of “ethnic cleansing” abroad. With the realignment of power in the United States over the last two decades, the Democrats effectively abandoned the historic demand for civil rights. This demand had once been an integral element of its electoral base, including labor and people of color, but the collapse of the New Deal Coalition and liberal-inspired state redistributive policies created space for a mean-spirited assault on the gains made by movements supporting labor and civil rights. 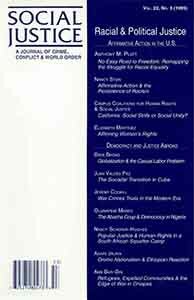 Contributors to this issue do an excellent job of analyzing the political initiatives that challenge any notion of equality as a fundamental norm in the United States, but also take halting steps toward elaborating a vision of socially just institutions fitting to the new global reality. 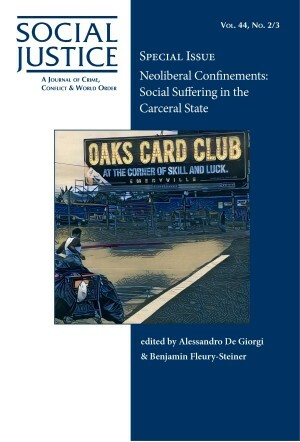 Campus Coalitions for Human Rights and Social Justice, California at a Crossroads: Social Strife or Social Unity?